South Korea is finally moving towards a ban on animal testing for cosmetic products – this February, the government passed a law which imposes heavy fines on C&T manufacturers that use animal testing on products or that are dealing with ingredients which were tested on animals. And over the last couple of years, a number of new organic and natural domestic beauty brands have appeared on the market. The entire trade show somehow seemed bigger and much busier than last year’s event. There were around 800 exhibition booths and 462 exhibitors from 18 countries on 18,378 sqm of floor space. 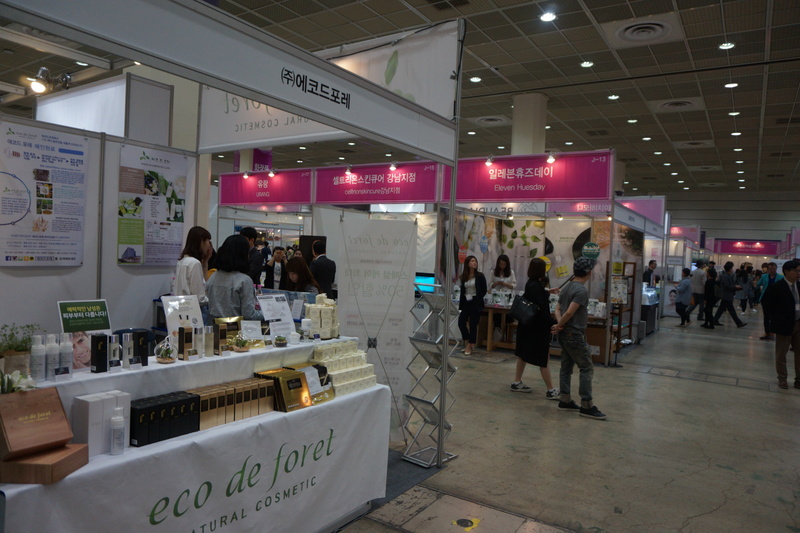 Like last year, Cosmobeauty took place together with the Organic & Natural Products Expo. This year, however, the organisers had placed the Organic Food Expo in the main hall Hall A rather than Hall B. It was more or less surrounded by the C&T exhibitors which resulted in more foot traffic for the organic food exhibitors. As I mentioned in the introduction, there was a strong natural and organic vibe at this year’s Cosmobeauty. Although the line-up of exhibitors included all of the big brands that attended last year – Lindsay, Konad, Fascy, Kocostar and so on – there were almost no Western companies (which surprised me as last year’s show had included quite a few European brands). 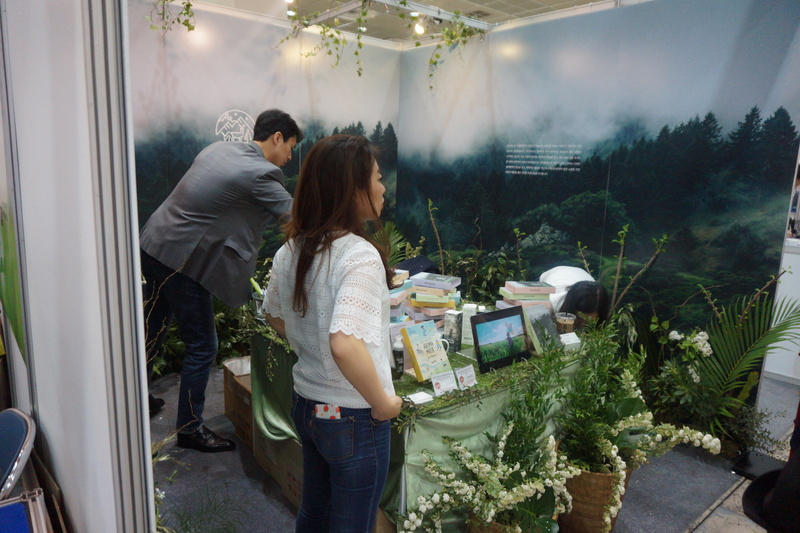 Instead there were many Korean newcomer brands, most of which were natural and/or organic. Yay! And now let’s dive straight into some of my favourite brand discoveries! 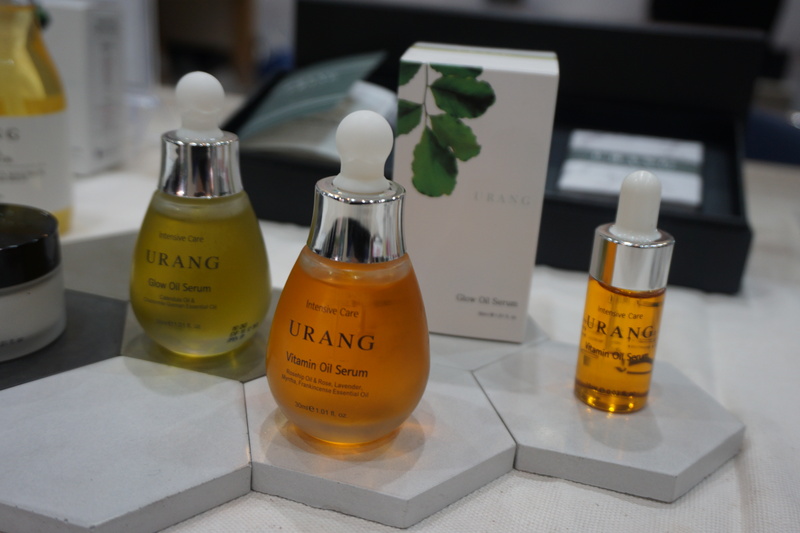 Organic brand Urang was launched in December 2016. Jina Lee, the brand’s founder, began creating her own organic cosmetics after she developed skin problems and couldn’t find any beauty products that agreed with her skin. She is also a trained aromatherapist so the essential oils in her products are carefully blended. 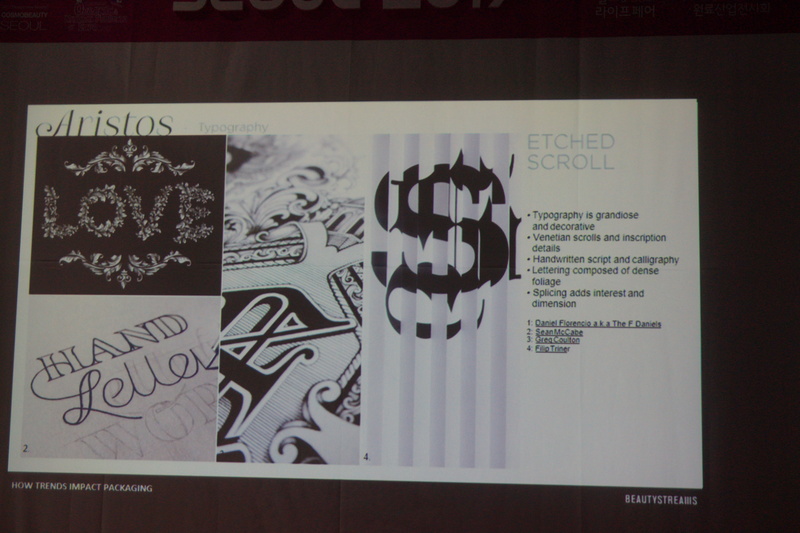 Urang’s portfolio includes eight products. There are three hydrosols – Perfect Daily Mist with neroli and camomile extract, Rose with, well, rose water, and Neroli with orange blossom water. Jina told me that the organic ingredients she uses in her products are imported from the UK so they are certified by Soil Association. The skin care line-up also includes two face oil blends – Vitamin with rosehip oil and rose oil and Glow with German camomile and calendula oil – the Rose Ceramide Ceream and a multibalm with calendula oil and tamanu oil which can be used on rough or dry skin patches. There is also a cleansing oil. Urang also offers six aroma sprays (see pic below), a hand sanitising spray which is scented with orange, a lemon-scented aroma sachet and five bar soaps. 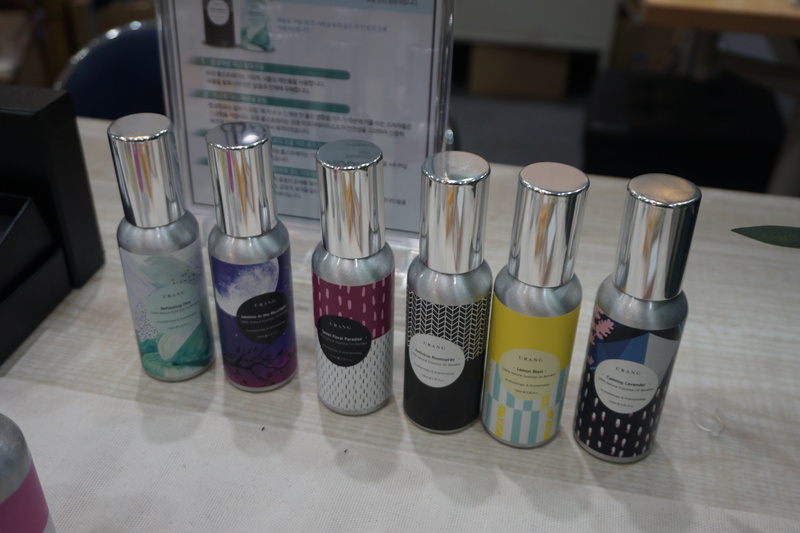 So far the products are only available online although the Aroma Sprays are also retailed in the Design Store at Seoul’s Dongdaemum Design Plaza. Stay Young was another interesting organic beauty company. The brand was launched in September 2016 and the portfolio focuses on skin and body care. The skin care range includes Channeul Toner (a thick, moisturising toner) and Channeul Emulsion (a light liquid hydrating lotion) and a lip balm stick. 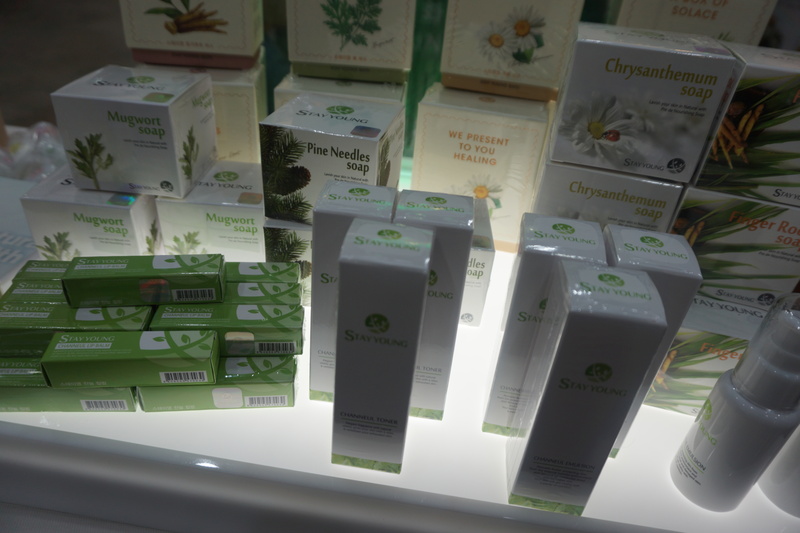 There are also two skin care creams which were just launched during the trade show. On the body care side, Stay Young’s line-up includes bar soaps and bath salts/body scrubs which are available in four variants (mugwort, chrysanthemum, pine needles and turmeric). Despite the fact that Stay Young is a young brand they already have managed to build up an impressive retail presence abroad. I was told that the products are available in mainland China, in some of the South East Asian markets and even in the Middle East. In Northern China with its cold, dusty and rough climate the lip balm is especially popular; it accounts for 90% of the brand’s turnover in mainland China. I also loved Beaudiani, yet another new natural beauty brand. 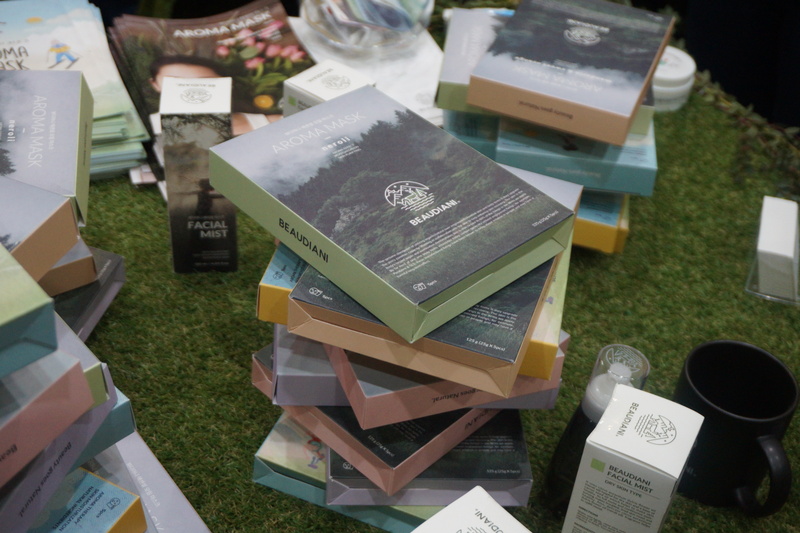 Beaudiani’s packagaging is striking, especially the face masks – the cool, misty forest imagery on the packaging was reflected in the brand’s exhibition stand (see pictures below); it looked so lush and relaxing. Plus they had soothing music playing in the background! Ok, so Beaudiani was launched in 2016; they specialise in face masks and skin care. Their product portfolio offers four Aroma sheet masks for adults and two Aroma sheet masks variants for children. Aroma Masks for Juniors are available in Lavender and Mandarin; the adult sheet masks are, respectively, Lavender, Mandarin & Sweet Orange, Rose and Neroli. The skin care line-up also includes two Facial Mists (Neroli and Rose). I received a sample of the Neroli face spray and tried it out that very evening in my hotel room. I’m impressed; a relaxing orange blossom fragrance and the spray moisturises! I really need to find out the INCIs for this product; there must be some kind of oil ingredient in it because it leaves a very light and cool film on my skin. So smooth! 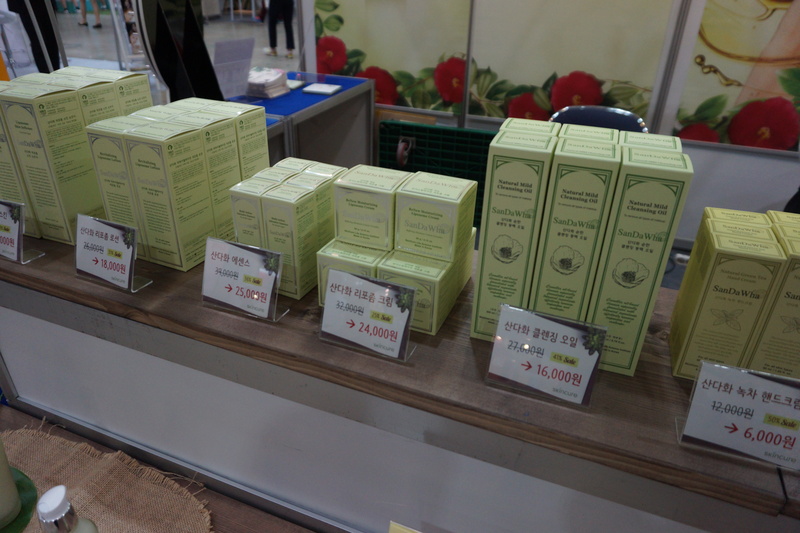 I had seen the products of organic Korean beauty brand SanDaWha on previous visits to Seoul. The two organic supermarket chains Dure-Coop and Orga Whole Foods both carry a selection of SanDaWha but their line-ups differ according to the size of the outlet and, presumably, the location of the store. 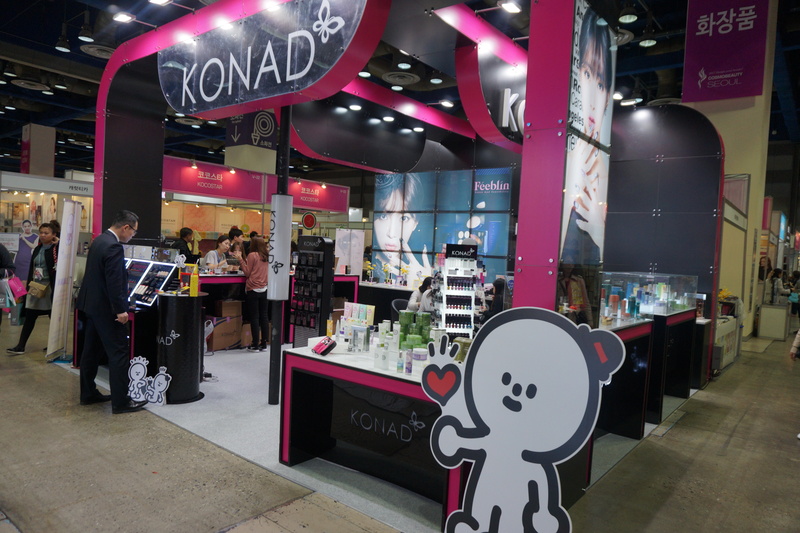 So I was excited to see the brand at Cosmobeauty Seoul and spent a lot of time (and money: trade show discounts!) at C&T manufacturer Skincure’s exhibition stand. 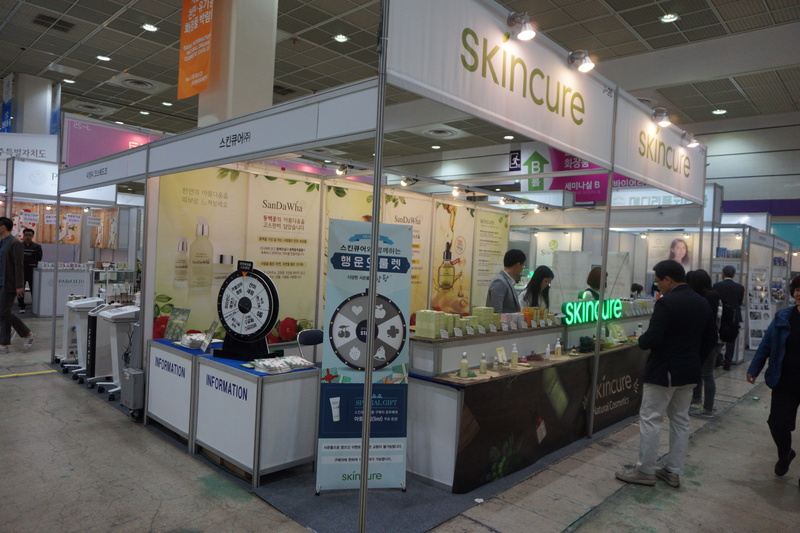 Skincure is from the Korean island of Jeju (which explains why so many of the company’s beauty products are based on camellia seed oil or water) and was founded in 2004. The company offers two main retail brands – SanDaWha (see picture above) and NoSte – which were both launched in 2005. In addition there are a number of professional/salon skin care ranges and Skincure is also active in ODM/OEM and private label manufacturing. In fact, I have just decided to do a Brand Profile on SanDaWha soon, because the company gave me an excellent and informative English-language company information brochure and I bought a whole bunch of products, so stay tuned for more info on SanDaWha! 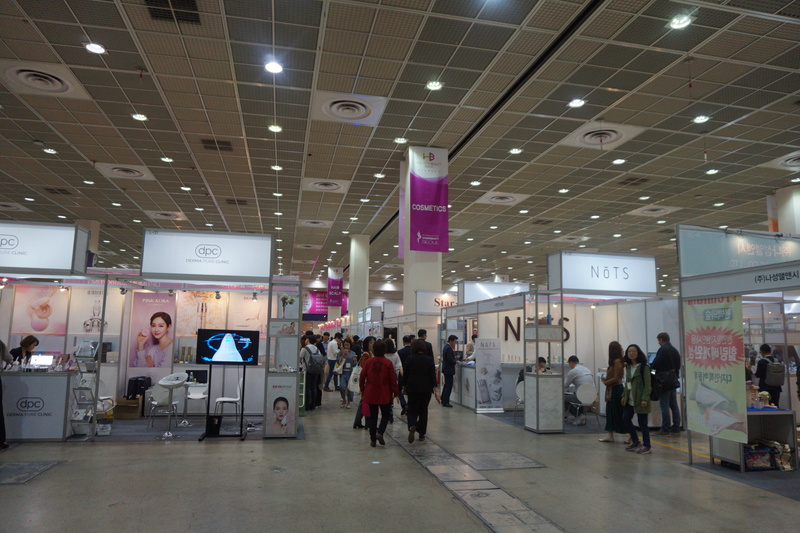 Of course SanDaWha wasn’t the only exhibitor from Jeju at Cosmobeauty: there was a whole clutch of Jeju brands including Parajeju, Accoje and J:Dew which I had seen around at various Asian C&T trade shows. 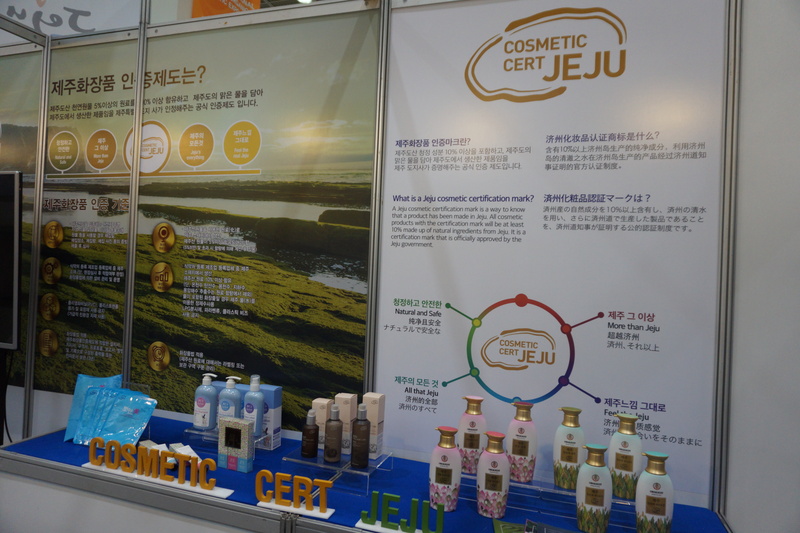 However, I was interested to see a new Jeju exhibitior at Cosmobeauty 2017: Cosmetic Cert Jeju is an official Jeju certification seal which was launched in 2016. If you’re familiar with K-Beauty you’ll undoubtedly know Jeju. It’s a Korean island which is not just one of the most popular holiday destinations for Koreans (and international visitors) but also stands for natural and pure ingredients: glacier water, volcanic ash, herbal ingredients and flower extracts. 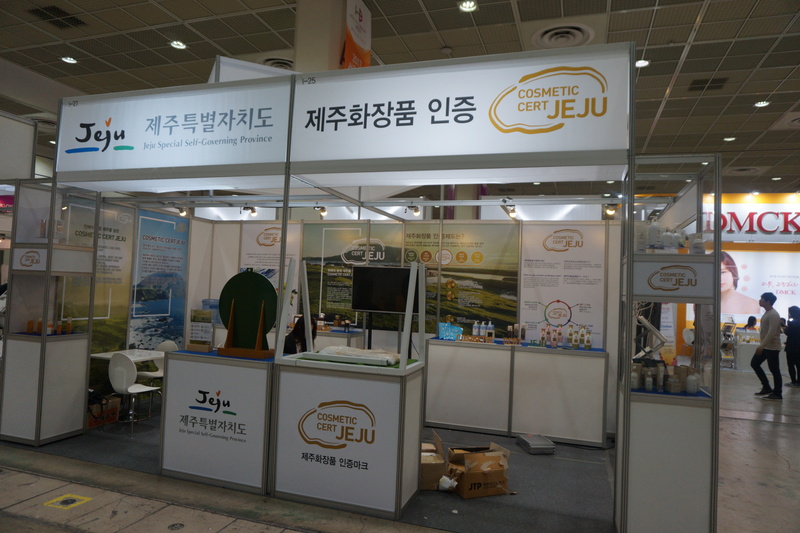 Jeju ingredients or a Jeju heritage are highly marketable assets for Korean cosmetics and food brands – you see a lot of Jeju product claims on packaging (“made in Jeju”, “with Jeju water” “includes Jeju green tea”). Innisfree is probably the best-known Jeju beauty brand in Korea and internationally, but there are many smaller beauty brands that also hail from Jeju. 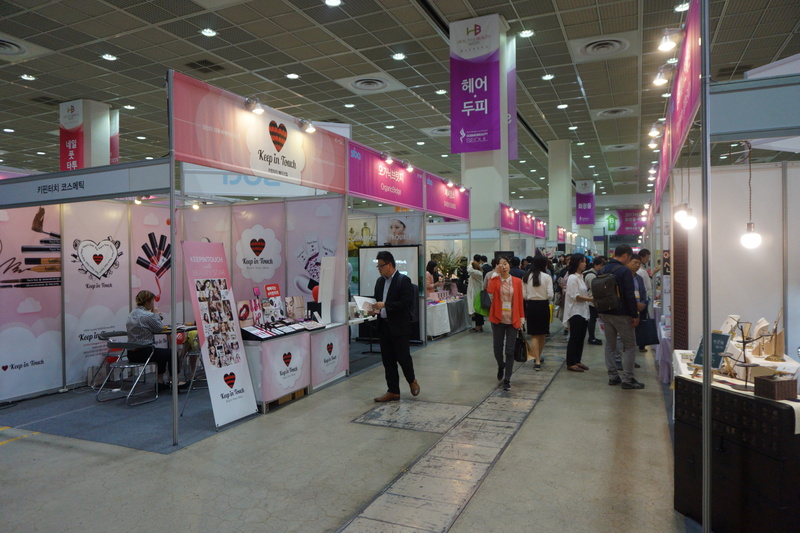 At every Asian trade show that I have attended so far the Korean exhibitor group always included Jeju brands. And I assume that must have been a lot of false Jeju advertising or rather, non-Jeju brands trying to profit from Jeju’s popularity, because in May 2016, Jeju launched its own official certification seal. Cosmetic Cert Jeju is only awarded to brands and/or product ranges if the products are manufactured with 100% Jeju ingredients. 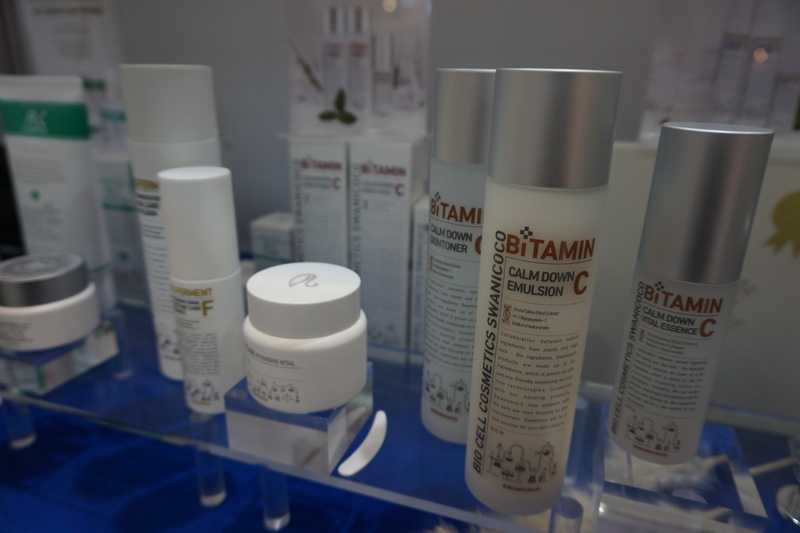 Several Korean beauty brands already carry the Cosmetic Cert Jeju logo on some of their products. Like Beyond’s Phyto Moisture series, The Face Shop’s Jeju Volcanic Lava range (see picture above), Innisfree’s Tangerine Vita C line or some of Tomaru’s sheet masks. The whole Jeju certification issue reminds me of the “Swissness”/“made in Switzerland” debate. Swiss ingredients, Swiss manufacturing and Swiss heritage are considered an international hallmark of quality in consumer goods (Swiss army knife, Swiss watches, Swiss suitcases…). And because “made in Switzerland” is such a valuable claim, there are many non-Swiss brands and companies that market their products as “made in Switzerland” even if only a small part of the product has been manufactured in Switzerland. Which, of course, doesn’t sit well with those brands that actually are from Switzerland! Or associations like the Swiss Federal Institute of Intellectual Property. In January 2017, a new “Swissness” legislation came into force which significantly tightens the regulations and criteria of what constitutes “Swiss-made” products. The Swiss Trademark Protection Act and the Swiss Coat of Arms Protection Act (designed to curb misuse of the official Swiss coat of arms seal) were also updated. Check out the site of the Federal Institute if you’re interested; they have a lot of English-language information. The same situation exists in the personal care market. If you live or travel in Asia – especially in countries like Taiwan, Hong Kong or China – you’ll have seen “Swiss” premium or spa beauty brands: the packaging might feature a white cross on a red background or the word Swiss forms part of the brand name. Swiss cosmetics stand for high quality, pure ingredients and careful manufacturing. Yet whether ALL beauty brands that claim “Swiss made” are actually MADE in Switzerland – well……! Don’t misunderstand me; the majority of Swiss brands that are sold in Asia – especially those brands retailed by reputable perfumery chains such as Sasa or Watson – are indeed manufactured in Switzerland. Or at least a significant portion of their ingredients are Swiss-made. According to the new “Swiss Made” Ordinance for Cosmetics (which also came into force this January), at least 60% of the ingredients of a cosmetic product must be manufactured in Switzerland and at least 80% of the research, development and production cost must originate in Switzerland as well. I researched a couple of these brands once and was surprised to find out that there are quite a few Swiss dermo beauty brands are manufactured exclusively for the Asian markets – especially the Chinese-speaking countries – and aren’t actually retailed in Switzerland or Europe. Anyway, this just goes to show how profitable a “made in Switzerland” claim can be for a beauty brand. Hah, I just thought of another example: Korean face mask brand SNP. They also have a Swiss cross in their company logo! Presumably signifying the high quality and dermo character of their face mask. And since it is highly likely that SNP’s products are manufactured exclusively in Asia, this is the purest form of Swissness! In the European food and beverage sector there are a number of national seals that protect the so-called “denomination of origin”. Like the Italian term DOP (Denominazione d’Origine Protetta) which means that balsamic vinegar can claim to be from Modena only if they actually ARE from Modena; or the French AOC (Appellation d’Origine Contrôlée ) which ensures that champagne wine can only be called “Champagne” if it is produced in the French Champagne region and so on. In Europe, regional product claims are taken very seriously and the EU has the regulations, certifications and seals to enforce them. I seem to have gone a bit off-topic here! Let’s return to Cosmobeauty. Lindsay – oh, how I love their modelling masks! I bought my first Lindsay masks during my first trip to Seoul in March 2015 (I ended up stuffing my suitcase with the mask cups!) 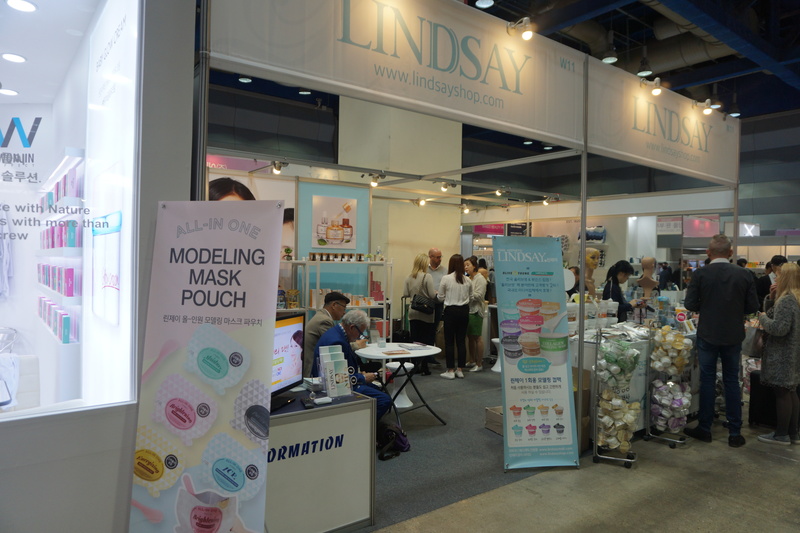 and was glad to see the much more travel-friendly fold-out flat pack modelling masks that Lindsay introduced at Cosmobeauty 2016. 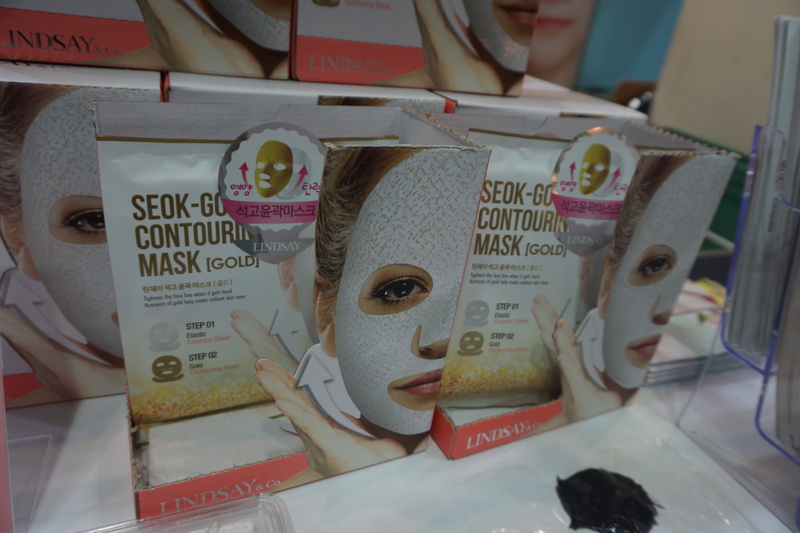 This year, Lindsay’s big mask innovation was the 2-part Seok-Go Contouring Mask (I’ve already posted a detailed description on Instagram). See picture below. The set includes two masks, a cellulose sheet mask which goes on first and a plaster mask which is applied on top of the cellulose mask. Interesting concept! I was also delighted to hear that the company is currently expanding into Europe. Finally! I was told that Lindsay is currently in negotiations with German perfumery retailer Douglas and the French Monoprix department store chain. Yay! I always enjoy seeing Kocostar and its fruit slice masks at the trade shows I visit. 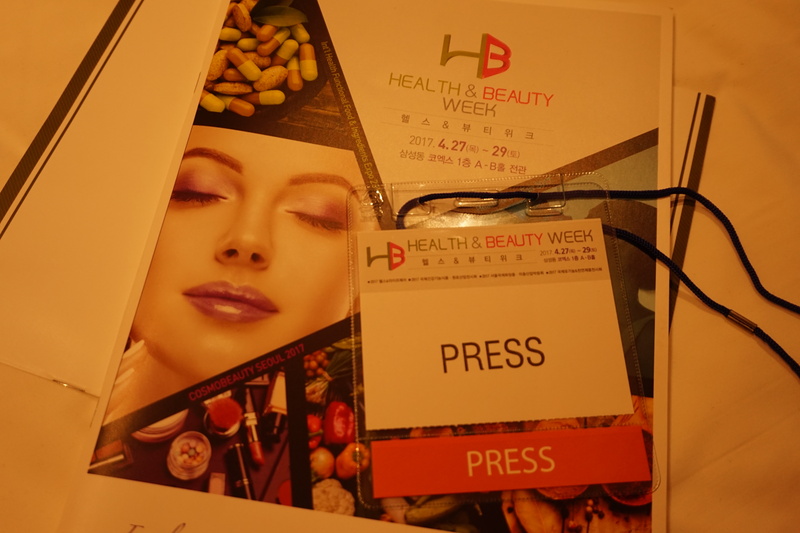 Over the last few years I’ve seen the brand at International Beauty Expo Korea 2015, Cosmobeauty 2016, Cosmoprof Asia 2016 or Cosmoprof Bologna 2017. 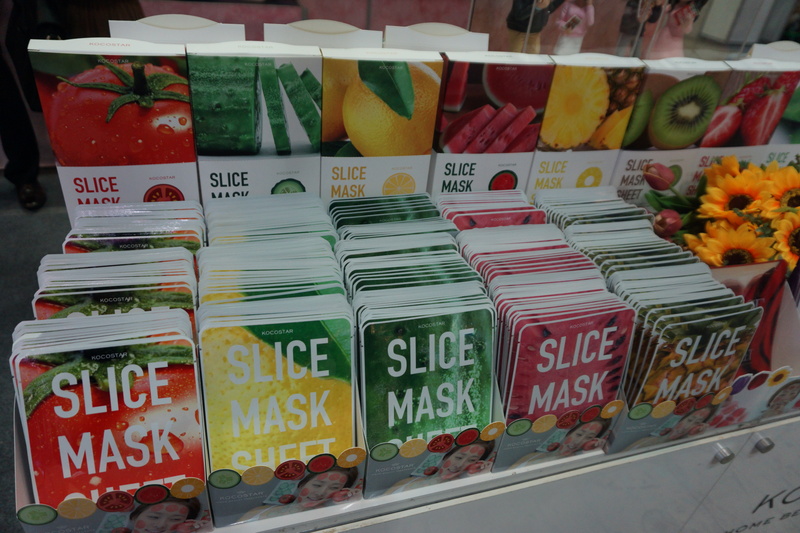 I had last checked out the brand’s products this March (Bologna); since then the packaging has been relaunched and the fruit slice mask range was extended with four new variants – banana, aloe, apple and strawberry. There are now 10 fruit slice masks in total. The brand’s Foot and Hand Masks (see below) were also updated with new packaging – I like the new, cleaner look. I had read about Korean beauty brand Swanicoco on various K-Beauty and AB (Asian Beauty) blogs and forums (hello Reddit!) but had never actually seen the products in real life, so to speak. 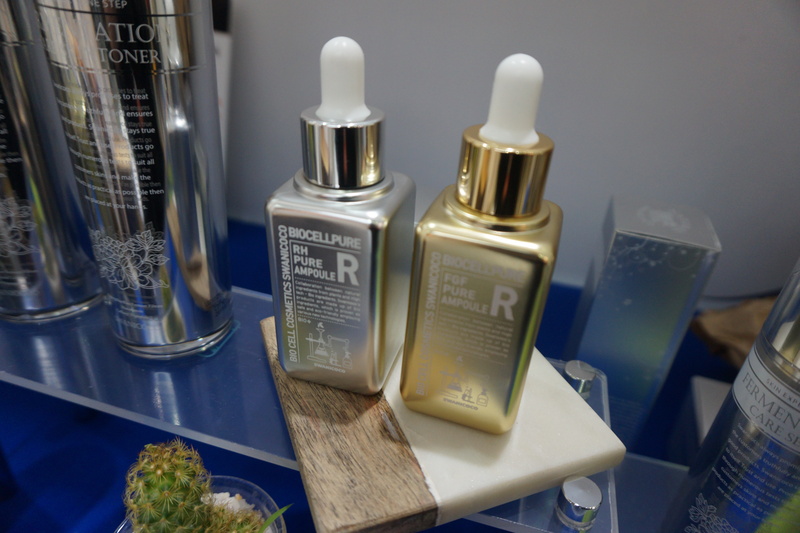 Luckily the brand was at Cosmobeauty and I was finally able to try out some of the Swanicoco products, including the EGF Ampoule (Epidermal Growth Factor, the silver bottle in the picture below; the gold bottle is an FGF Ampoule – FGF stands for Fibroblast Growth Factor), the fermented snail lotion and the limited edition Gold Ginseng Ampoule which I already posted about on Instagram. Rosé from Swanicoco very kindly supplied me with a whole bunch of samples (and a full-sized EGF Ampoule, thank you Rosé!). The EGF Ampoule is an excellent moisturising layer which my skin desperately needs in all of this air-conditioning. I also asked her a lot of questions about the brand. 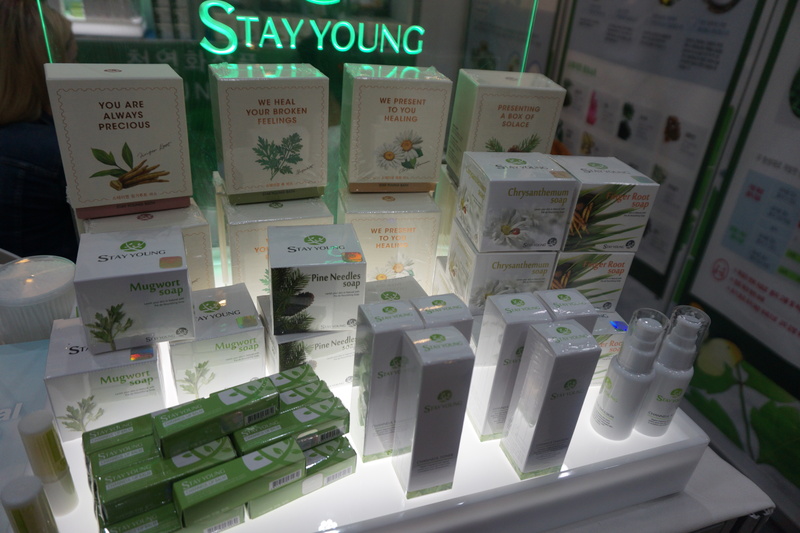 Swanicoco was launched in 2007, the brand currently has 28 own brand stores across Korea and the products are also sold in some LOHBS drugstores. In total there are 160 sku across face care, body care, colour cosmetics and hair care. Swanicoco is also expanding internationally – in the US the brand started out online at first, then moved into perfumery chains Sephora and Ulta Beauty and Nordstrom department store. I was told Swanicoco is also sold in Malaysia (Watsons) and Hong Kong (ditto) and that the brand is planning to start in China really soon. In Europe Swanicoco’s products are mostly available online – for example in Spain, Poland and Belgium, with the UK to be added to the roster soon; in Spain there are some offline stores that stock Swanicoco. The brand’s best-selling skin care range internationally is the fermented snail care line. The E=qual home fragrances exhibition stand looked very stylish so I stopped by to check out this brand. 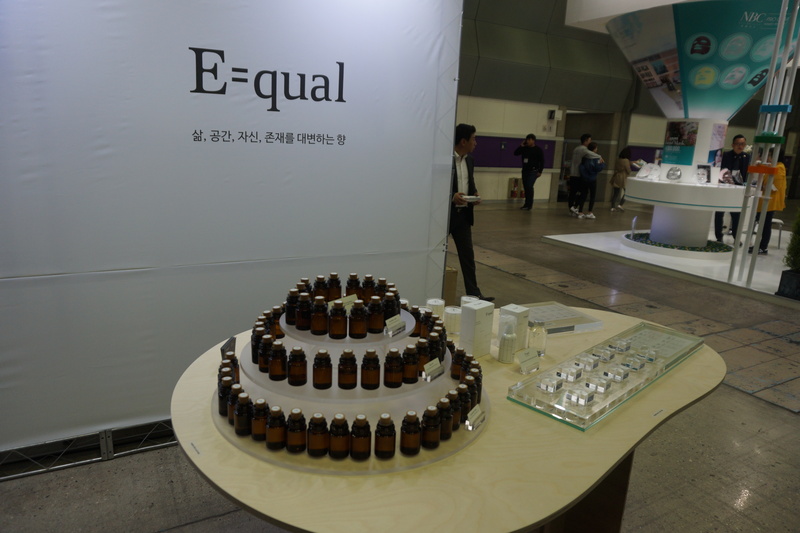 The company behind E=qual is flavours and fragrance manufacturer French-Korean Aromatics. In August 2016, FKA launched the E=qual range of candles and diffusers which are available in ten different fragrances and five different room sprays. I also attended two of the trade show’s conference presentations. Joanna said that the Asia Pacific region (including East Asia, South East Asia and India) was the largest international market for colour cosmetics and also the fastest growing region in the colour cosmetics category. Economic conditions are good in Asia Pacific and especially in the developing countries, which explains why sales are burgeoning in that region. Incidentally, the global market for colour cosmetics reached turnover of 60bn USD in 2016. Wow! 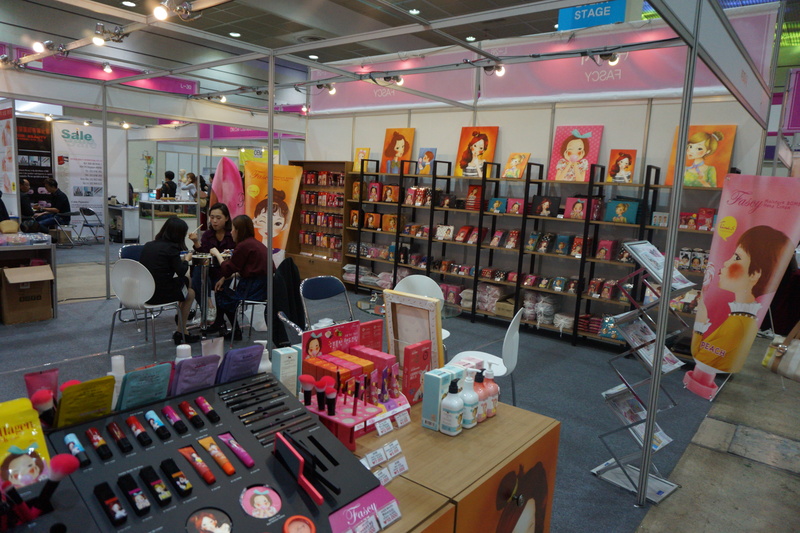 The largest regional colour cosmetics markets in the Asia Pacific region are India, China and Korea. India is the fastest-growing market, followed by China and then Korea. And from the East Asian countries, Korea was the fastest-growing market while the Japanese market brought up the rear in terms of turnover development. After this overview, Joanna analysed the individual product categories within the colour cosmetics market. Facial makeup such as foundations, BB creams etc. accounts for the biggest slice of the colour cos market, followed by lipsticks and glosses. And BB/CC creams were the fast-growing subcategory last year. L’Oréal is the market leader in the Asia Pacific region last year (no surprise there, L’Oréal always dominates everything), followed by Japan’s Shiseido and Kao, AmorePacific from Korea and Estée Lauder from the US. For Korean C&T manufacturers, China is the biggest regional market, followed by Hong Kong and Japan. However, the developing Asian countries – especially in South East Asia – also hold great potential for colour cosmetics brands from Korea. I was particularly interested in a chart which showed an overview of Korean C&T exports. I already knew that mainland China was the biggest market for Korean beauty but had no idea that in 2016 China accounted for as much as 36% of Korea’s entire cosmetics exports! The second-biggest export country was Hong Kong with 31%, followed by the US with 9% and the Rest of the World (excluding Asia and South East Asia which were listed separately) with another 9% market share. And indeed, in Western Europe we still have next to no Korean beauty brands in retail stores but there are quite a few K-Beauty online stores (most of which were launched in the last 15 months or so) so things might change soon. 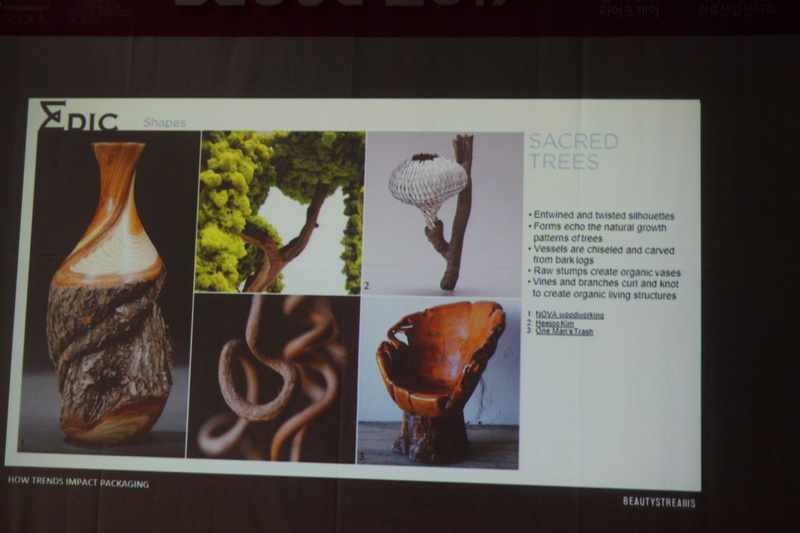 Joanna then presented two regional markets in more detail – India and Indonesia. I’ve read a lot about the Indian C&T market so I knew the basics, but I had never really thought about the Indonesian beauty market, although I’ve travelled in SEA so much over the past ten years. Shame on me! With turnover of 875m USD, India is the largest colour cosmetics market in the world. Lip makeup is the biggest product category and department stores are the main retail channel for colour cosmetics. The Indonesian market for colour cosmetics was worth 426m USD in 2016; lip products were also the biggest category but Indonesian women tend to buy their makeup in health & beauty retailers (the largest distribution channel for colour cosmetics) while direct selling is a retail channel that is also growing fast. 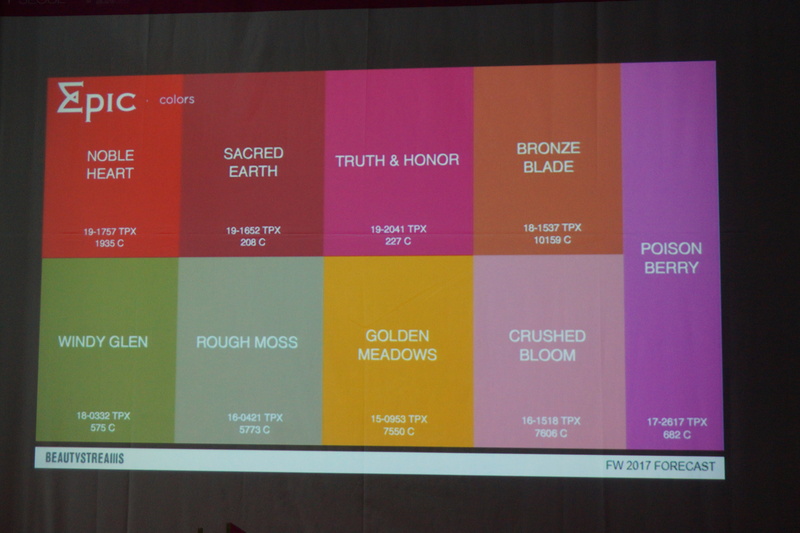 Joanna also highlighted some individual colour cosmetics trends – she said, for example, that Asian brands are increasingly launching not just “normal” sun protection products (with UVA/UVB filters) but that IR (infrared waves) and HEV (high energy waves) are also a concern for many consumers. And many C&T manufacturers are now introducing products with IR and HEV protection in their Asian markets. Interesting! She also pointed out that ageing consumers will be a major customer demographic in the very near future and that Western brands have already (more or less) embraced this – i.e. there is beauty advertising and imagery featuring older models. Asian beauty brands, however, are not quite there yet and are still fixated on super-young dewy-skinned models (ok, that last bit was my own interpretation!). 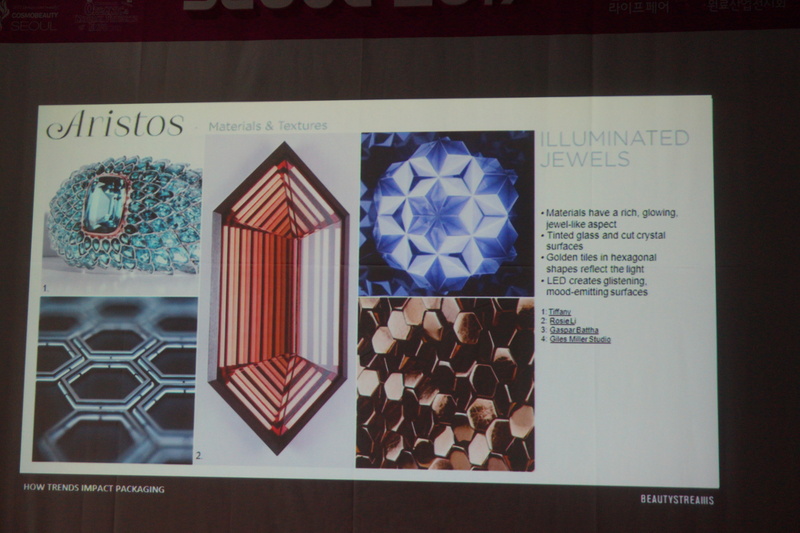 On the second day of the trade show I attended a lecture by Chaewon Lee from French trends agency Beautystreams, “How trends impact packaging” – quite possibly the most beautiful slides I’ve ever seen, full of luscious images of colours and textures; they resembled mood-boards or Pinterest pages. I’ve posted some pics of the slides below. First Chaewon introduced the Beautystreams forecast methodology: each trend forecast consists of a number of key micro trends which illustrate various aspects of the “big” trend: in the case of the packaging forecasts the constituent categories are Colours, Inspirational Textures, Concepts, Influences, Materials & Textures, Shapes, Typography and Original Design. In its forecasts Beautystreams analyses previous trend movements; they monitor retail and market development of brands and products and take inspiration from street fashion and from runway/fashion shows. Each of the categories was illustrated by images, pictures and drawings which makes the “finished” trend surprisingly three-dimensional! 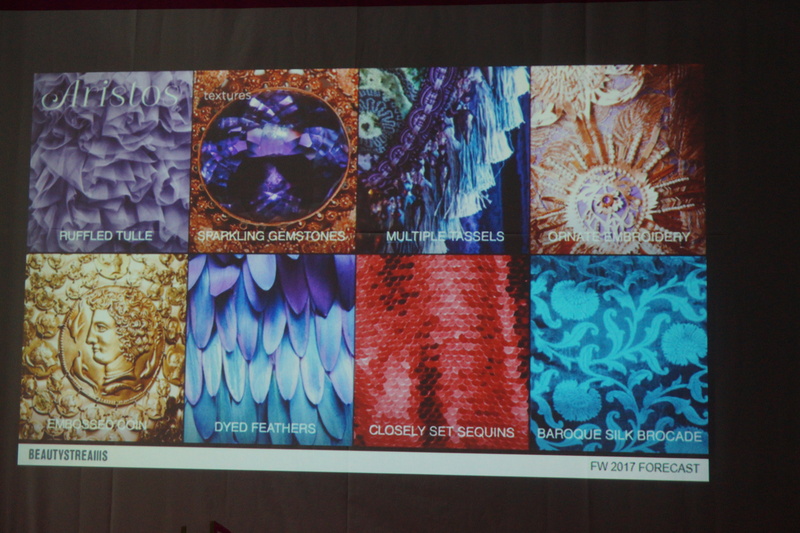 The two packaging forecasts Chaewon presented were for the Autumn/Winter 2018 season – it always takes several seasons until a packaging trend forecast becomes reality, because the production/manufacturing process of beauty products takes time and of course each client interprets the trend forecast differently. And these are the two forecasts: Aristos and Epics! In terms of Colour, Aristos are associated with muted copper, brass and leather tones or cool dark blues, fog grey or pale purple (the company has really evocative names for these colour shades, by the way). As far as Materials are concerned, Aristos are all about sparkling gemstones, pearl embroidery and crystal beading; silk brocade and tulle, died feathers and embossed gold accents – think opulence and gloss combined with an edgy look. Influences include gilded castle architecture, gold leaf ornaments and gold filigree or deep navy or glossy black with gold accents. Products for Aristos will be influenced by a multi-cultural global style which combines influences from Asia, Africa and South America with traditional European elements. Draped fabrics, cascading styles of silk, chiffon and organza; Shapes might include faceted columns, cut angles and elongated geometric forms, smooth glass, polished copper. And the Typography associated with Aristos is be grandiose and decorative – think hand-written lettering and calligraphy – but also simple block letters and bold sans serif fonts. There were also pack designs that illustrated what the Aristos trend might look like translated into cosmetics packaging – heavy perfume glass flacons, for example, laser-cut filigree details, refined, embossed paper packaging ; a new oils dispenser design or holographic elements on packaging. Epics, on the other hand, are all about warmer earthy colours, grey-toned green, orange-bronze, bright red, dusty pink or muted golden yellow. 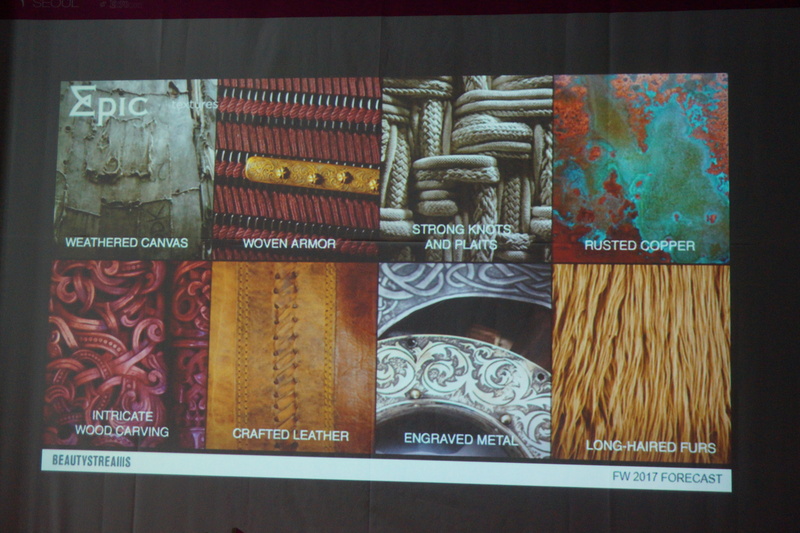 Textures might include weathered canvas material, rusted copper, carved wooden elements, heavy leather, long-haired furs and engraved metal while Influences are ancient warrior weapons and clothing – stitched and tooled leather, chain mail, carvings or padded fabric. Other key influences are wilderness and outdoor living – think rough textures, moss, craggy surfaces, stones, branches and minerals; food and shelter sources from nature, clothing made from animal pelts. Also weathered and raw materials, unfinished wood and raw barks are key materials in furniture design; carved woods, wet earth; organic and natural materials fused with modern technology. 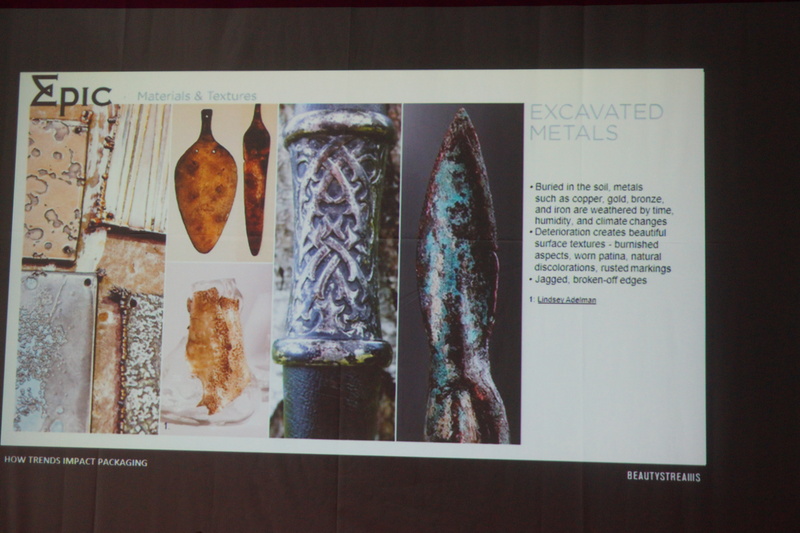 Copper, bronze and iron with deteriorated, oxidised surfaces, jagged edges, patina or rusted markings. As far as Shapes are concerned, Epic is associated with uneven, crooked and unbalanced forms which follow the natural shape of the material; entwined and twisted silhouettes, vessels carved from bark or tree stumps while Typography might include Celtic writing and symbols, embellished borders and decorated manuscripts, braid motifs and animal shapes entwined with the lettering – stylized lettering or rust discolourations. 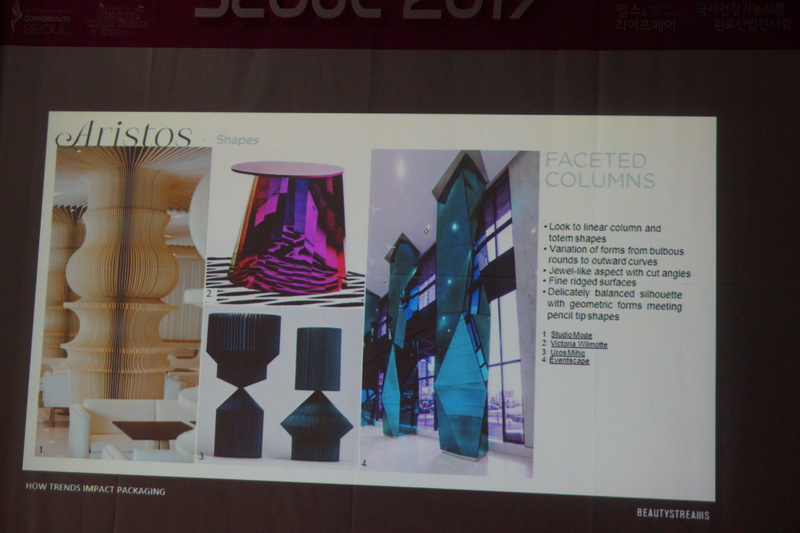 In the last part of the presentation Chaewon showed us beauty products and packaging designs that were launched over the past few months or were shown at recent C&T and packaging trade shows. 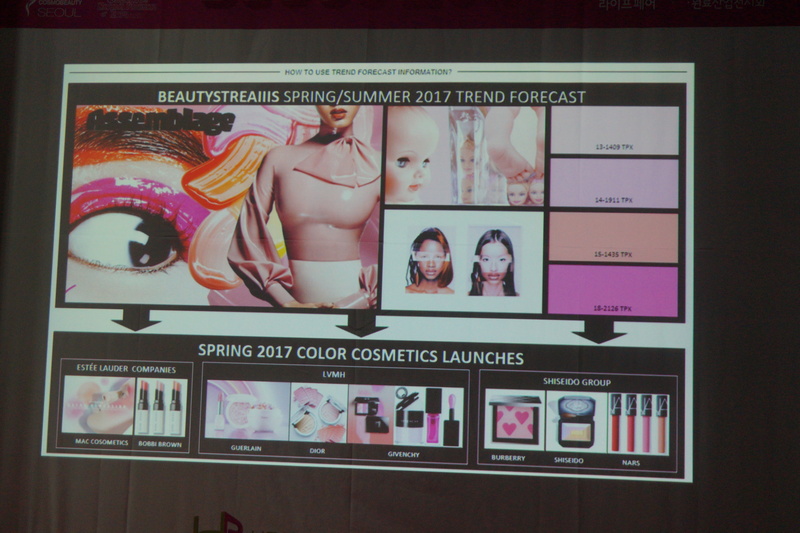 These products and designs are based on Beautystreams’ forecasts from a couple of years ago; the slides showed the key points of the Beautystreams forecast in the upper part of the slide and the finished beauty products in the lower half. It was fascinating to see how the various international C&T manufacturers have interpreted the trends. So yeah, altogether a really cool trade show – discovering interesting brands, meeting nice people and learning stuff. I look forward to Cosmobeauty 2018! Sehr gut recherchiert, fundierte Infos für alle Stakeholders in dieser Branche! Man merkt bei jeder Zeile, dass du deine Arbeit liebst :-). Gute Arbeit Anni!